The Delaware County Engineer’s Office will begin widening Home Road at the intersection of state Route 315 in February or March 2019. 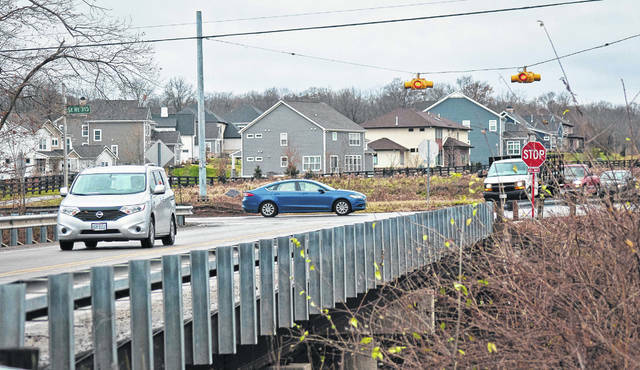 As seen in the photo, the two-lane bridge spanning the Olentangy River will be widened to accommodate additional lanes to match the improvements of the intersection. The Delaware County Board of Commissioners, during its Nov. 19 session, approved several road improvement projects planned by the county engineer’s office for 2019. Rob Riley, chief deputy engineer, explained the widening of Home Road at the intersection of state Route 315, and he requested the commissioners’ permission to put the project out for bids. Riley said the project has been in the works for over six years. He said the widening would add extra lanes in both directions on Home Road and a traffic light. Riley said the project is estimated at $8.5 million, and the engineer’s office hopes to begin construction later this winter around February or March. He said the work will begin with widening the bridge on Home Road that spans the Olentangy River. Riley said the engineer’s office realizes that it will be difficult for the residents in the area, but he thinks improvements will have a terrific impact on the area. He said the work for the intersection will be completed sometime in October 2019. Commissioners approved putting the project out to bid until 10 a.m. on Dec. 18. Riley said the engineer’s estimate for the project was for $812,000, and the work would be done in 2019. According to the contract, the bid from Shelly and Sands Inc. was $738,944. Riley told commissioners that Freeman Road would need to be closed for about six weeks during construction, but he asked commissioners not to hold him to the time frame. Riley added the county engineer’s office has worked with Shelly and Sands Inc. on many county projects and recommended approving the contract. Commissioners awarded the bid and approved the contract with the company for the road improvements for the Worthington Road/Freeman Road intersection. Riley told commissioners there was an initial agreement with the developers of North Star to widen Wilson Road from three lanes to five lanes just west of Galena Road once it was needed. Riley said in lieu of holding the developer to widening the road in the future, they will put $643,000 toward the county’s local share of the Ohio Department of Transportation’s (ODOT) improvements of the intersection of Galena Road and U.S. 36/state Route 37. Commissioners approved the agreement and applying the money to the project. This entry was tagged D. Anthony Botkin, Delaware County Commissioners, Road Improvements, Road Work, Rob Riley. Bookmark the permalink.